The terminology for reporting human papillomavirus-associated squamous lesions in the cervix, both in tissue samples and cytology specimens, has suffered from many changes throughout the last years creating confusion in interpreting cervical biopsy and cytology reports by clinicians. This review presents a summary and discussion of the current terminology for reporting results of cervical biopsies and cytology with emphasis in the lower anogenital squamous terminology consensus recommendations for tissue specimens and the 2001 Bethesda Workshop for reporting cytology results. 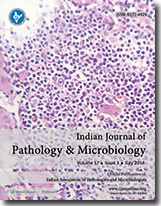 Microscopic features of cervical lesions in tissue samples and cytology specimens are presented. Biomarkers, including p16 and Ki-67, are discussed and how they can help the pathologist when dealing with difficult cases. 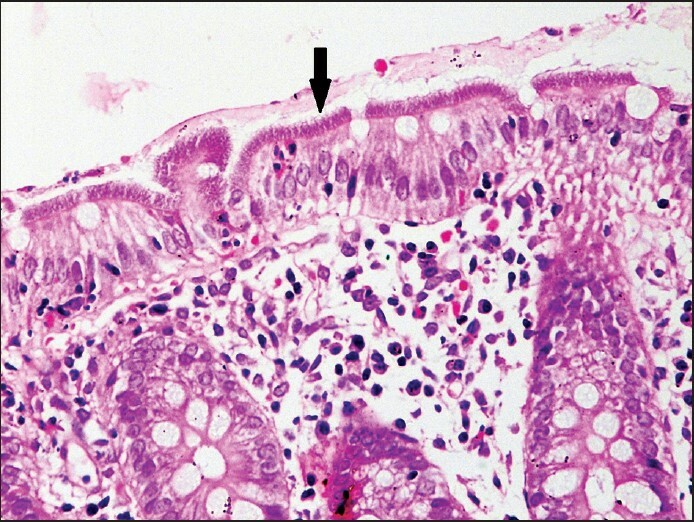 Background: Acetylcholinesterase (AChE) histochemistry on rectal mucosal biopsies accurately diagnoses Hirschsprung disease (HD), but is not widely employed as it requires special tissue handling and pathologist expertise. 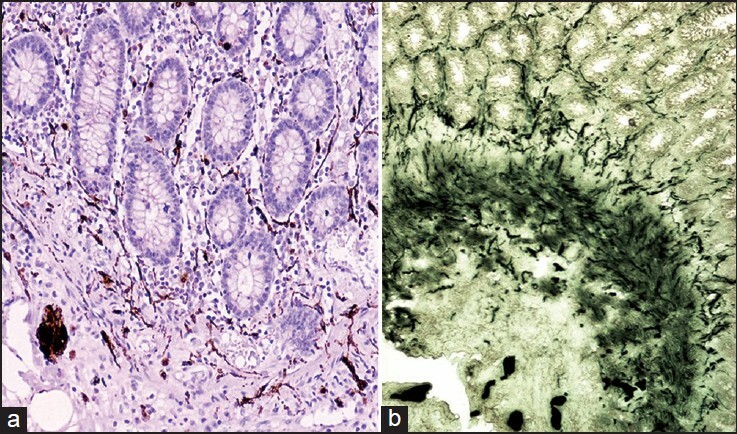 Calretinin immunohistochemistry (IHC) has been reported to be comparable to AChE staining with the loss of expression correlating with aganglionosis. Aim: The aim was to evaluate calretinin IHC as a primary diagnostic tool in comparison to the improvised rapid AChE technique in the diagnosis of HD. Materials and Methods: A total of 74 rectal biopsies (18 fresh frozen - 18 cases, 56 formalin fixed - 33 cases) from 51 cases of suspect HD were evaluated with hematoxylin and eosin/AChE/Calretinin. Ten biopsies each from ganglionated and aganglionated segments served as positive and negative controls. Ileal (3), appendiceal (3) and ring bowel (2) biopsies were also included. Two pathologists blinded to the clinical details evaluated the histomorphology with AChE and calretinin. Observations were statistically analyzed and Cohen's k coefficient employed to assess agreement between two pathologists and calretinin and the AChE. Results: The study confirmed HD in 26 and non-HD in 25 cases. There were 7 neonates, 5 low level biopsies and 14 "inadequate" biopsies. The results of calretinin were comparable with AChE with a statistically significant measure of agreement of k = 0.973 between the two. One false-positive case of HD was noted with calretinin. The advantages and disadvantages of calretinin versus AChE are discussed. Conclusion: Calretinin is a reliable single immune marker for ruling out HD by its specific positive mucosal staining of formalin fixed rectal biopsy. The improvised AChE staining remains indispensable to confirm HD on fresh biopsies and thus, along with calretinin IHC maximizes the diagnostic accuracy of HD in difficult cases. Context: Brain metastases are the most common intracranial neoplasms. They are often the first symptom of systemic malignancy. 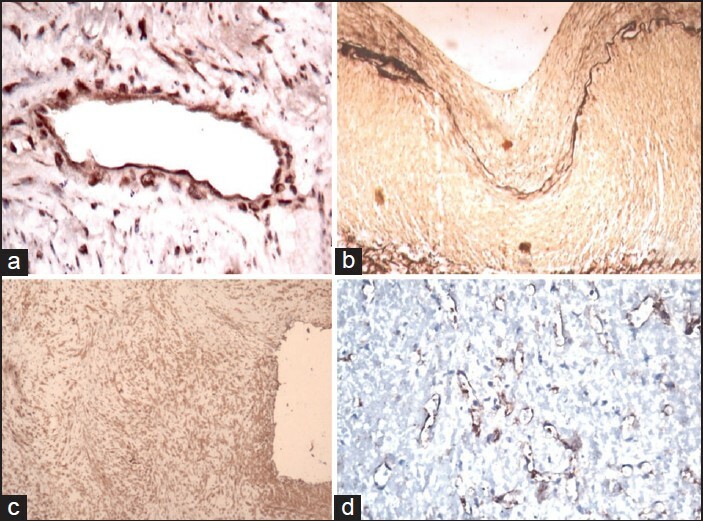 Hence, immunohistochemistry (IHC) is of importance in evaluating the origin of brain metastases. Aims: The aim was to detect the primary site of brain metastases and evaluate the role of IHC in diagnosing the same. Materials and Methods: Data of 74 patients of brain metastases with unknown primary was analyzed. IHC was performed in these cases. The histopathological findings were correlated with clinical and radiological data. 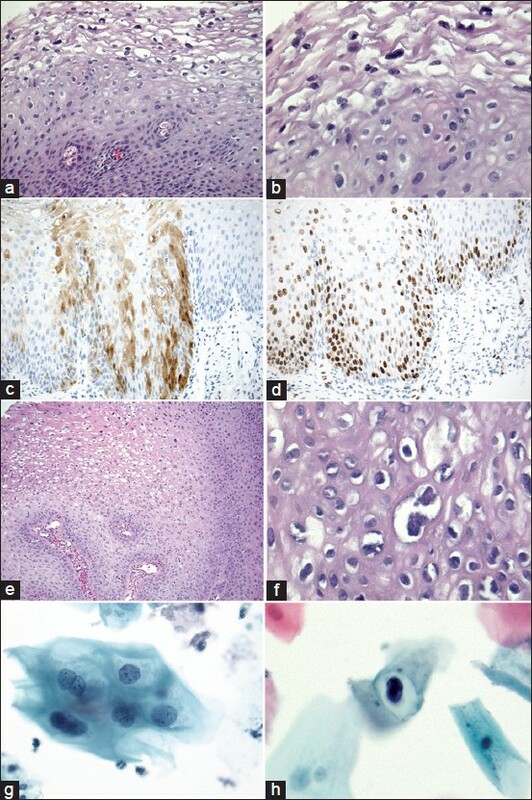 Results: Of 74 cases in which IHC was done; the most common primary site was lung (51 cases). Even after applying IHC, the primary could not be diagnosed in 10 cases. Conclusion: Brain metastases are often the first indicator of systemic malignancy. 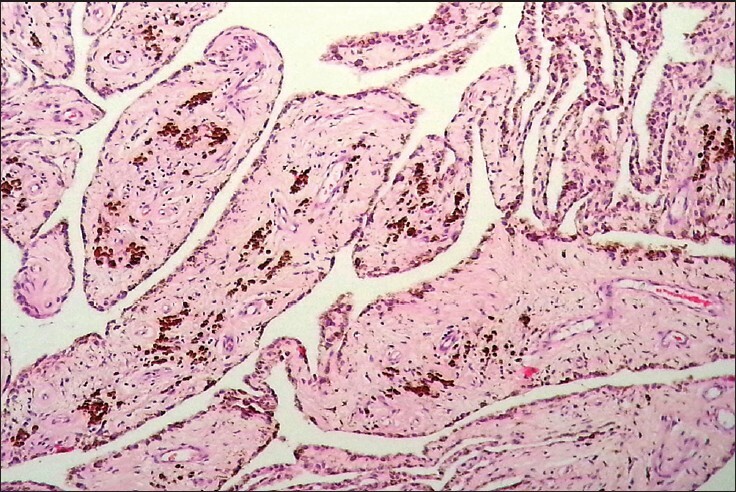 Lung is the most common primary site in cases with unknown primary, as deduced by IHC findings. Context: Biliary atresia (BA) is a destructive process affecting both extra- and intra-hepatic bile ducts leading to fibrosis and obliteration of the biliary tree and cirrhosis usually within 2 years. Factors influencing the outcome of portoenterostomy (PE) have not been clearly defined. Aims: Our aim was to identify children with no evidence of liver disease 10 years or more after PE and to compare the pathology of liver and biliary remnants in this group with those associated with poor outcome. Settings and Design: Prospective observational study. 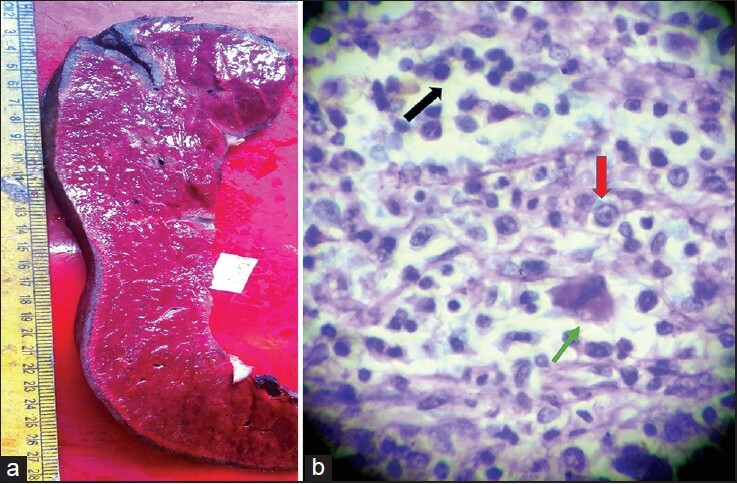 Materials and Methods: Wedge biopsies of liver and portal remnants, taken at the time of PE, where available, were reviewed. 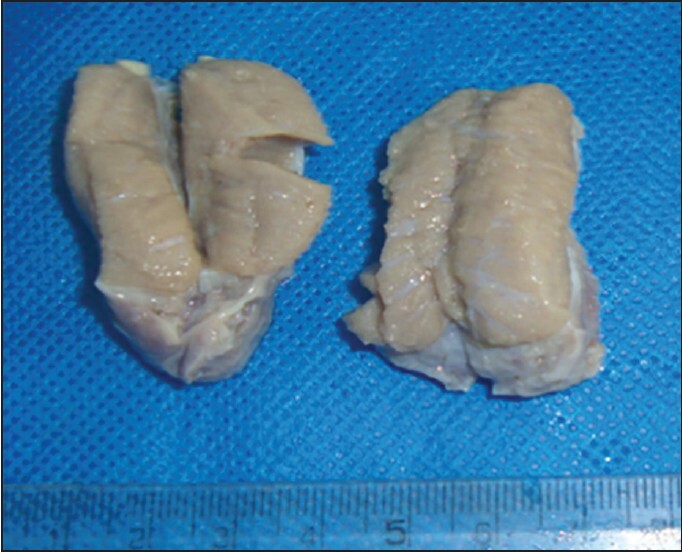 The parameters studied were - presence of large bile ducts (>150 μ), degree of fibrosis and bile duct proliferation (BDP), presence of ductal plate malformation (DPM) and age at operation. Statistical Analysis Used: Fisher's exact test with Freeman Halton extension for univariate analysis and Logistic regression analysis as multivariate analysis. Results: Of 68 cases operated between 1995 and 2001, 14 patients survived >10 years and 54 were associated with poor outcome. Large ducts were significantly more in survivors (70% vs. 26%, P = 0.02). DPM was not seen in any of the survivors and was present in 24% of poor outcome group. Fibrosis and BDP were also significantly less among the survivors (P < 0.001, P = 0.03, respectively). The mean ages at operation in the two groups were 66.8 and 89.6 days, respectively. Conclusion: From this study, we feel that lower degree of fibrosis and BDP, absence of DPM, presence of large ducts and younger age at operation were associated with better long-term outcome. Of these, degree of fibrosis was the most significant factor. Background: Interface dermatitis (ID) refers to a pattern of skin reaction characterized by an inflammatory infiltrate that appears to obscure the dermo-epidermal junction when observed at low power examination and referred to as lichenoid tissue reaction. A wide range of inflammatory skin diseases exhibits interface change with considerable overlap of histological features. The aim of the present study was to study the clinical features and microscopic features of ID. Materials and Methods: The material for the present study consisted of skin biopsy samples collected from patients attending the outpatient Department of Dermatology. The study was conducted for a period of 3 years from 2007 to 2010. During this period, a total of 125 cases was studied. Results: In the present study, a total of 125 cases of ID was studied which presented clinically as papulosquamous disorders. Majority of the cases of ID were seen in women (57.6%). 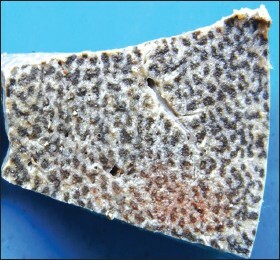 Majority of ID were lichen planus (LP) and its variants (63.2%). Clinicopathological concordance was seen in 109 cases (87.2%) and discordance in 16 cases (12.8%). Conclusion: The mere presence of an interface lichenoid inflammatory reaction should not be the sole criterion for the diagnosis of LP or one of its many variants, as now seems to be the case. A clinicopathologic correlation is absolutely essential for a conclusive diagnosis of ID. 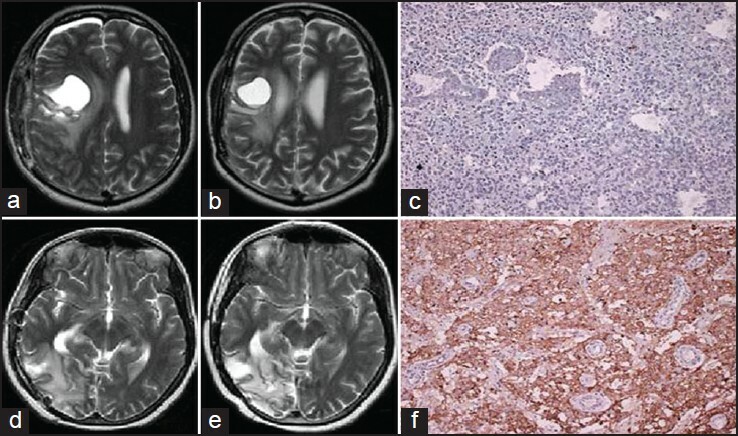 Background and Aim: Glioblastoma multiforme (GBM) are the most aggressive class of cancer of central nervous system with hallmark characteristics that include rampant proliferation, necrosis, and endothelial proliferation. Epidermal growth factor receptor (EGFR) has been implicated as the primary contributor to glioblastoma initiation and succession. The present study was designed to evaluate EGFR protein expression in GBM as predictor of response to therapy and survival. Materials and Methods: Epidermal growth factor receptor was assessed by immunohistochemistry as a percentage of positive tumor cells in hot spots (10 high-power fields). The study group comprised of 35 cases of GBM. All cases underwent surgical resection and subsequently underwent radiotherapy (n = 17) or radiotherapy with adjuvant temozolomide chemotherapy (n = 18). Immediate response to therapy was assessed at 3 months using World Health Organization response evaluation criteria in solid tumors criteria and cases followed up for survival. Results: Twenty-four cases (68.6%) expressed EGFR while 11/35 (31.4%) cases were negative. Response to therapy was evident in 21/35 cases (60.0%) and 14/35 were (40.0%) nonresponders. Mean EGFR protein expression in responders was 37.23 ± 33.70 and in nonresponders was 59.5 ± 39.46 (P = 0.542). The percentage of responders which were EGFR negative was 72.7% and while response in EGFR positive cases was observed in 54.2%. Mean survival in EGFR positive and negative GBM was 394.37 ± 189.11 and 420.54 ± 191.23 days, respectively. Conclusion: The EGFR negative cases appear to respond better to therapy, however, the difference is not statistically significant (P = 0.298). Further, EGFR protein expression does not play a definitive role in predicting survival. This is an original study evaluating EGFR in terms of therapeutic response. Background: Bone marrow biopsy is widely used method for diagnosis, follow-up and staging of hemato-oncologic diseases. This procedure is also used for determining the bone marrow metastasis in patients with solid tumors. 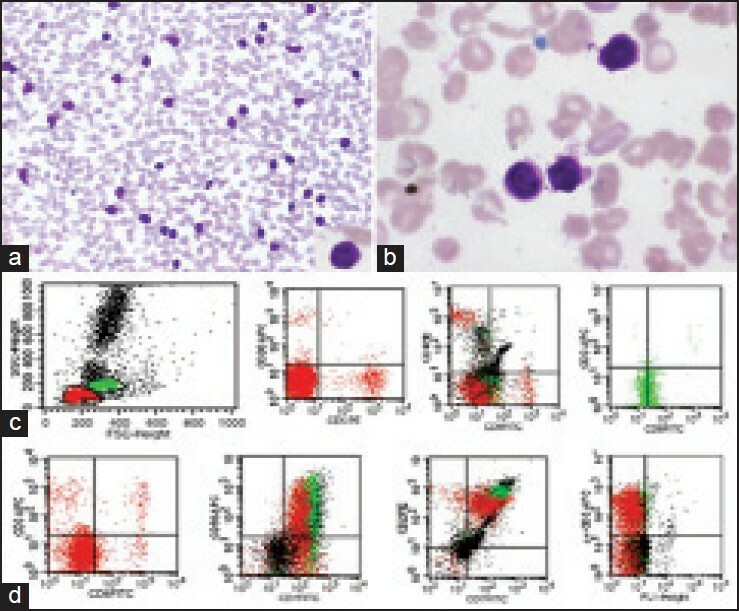 In this study, clinical, hematological, and pathological features of 58 patients with bone marrow metastases diagnosed by bone marrow biopsies were examined retrospectively Materials and Methods: Among 3345 bone marrow biopsies performed in our hospital between January 2006 and August 2013, 58 cases with solid tumor metastasized to bone marrow were included in this study. Results: Among 58 cases with solid organ carcinoma metastasis in bone marrow, mean age was 59.9. Thirty-nine cases were found to have a known primary tumor focus. 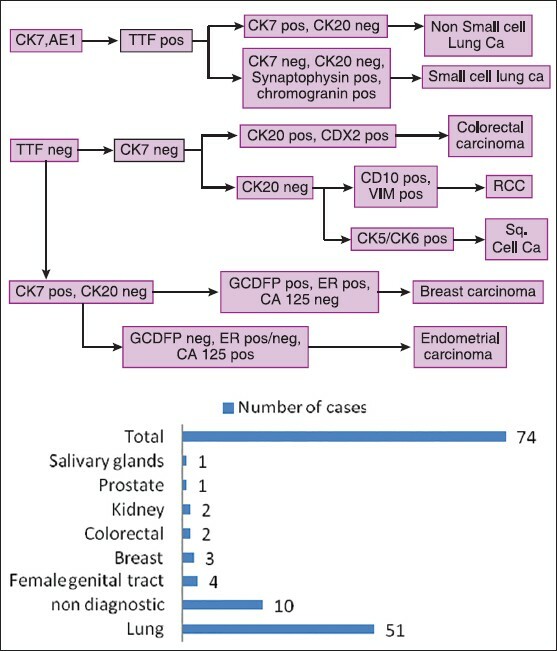 The most common tumors metastasized to bone marrow were breast carcinomas (23 patients, 59%), gastric carcinomas (6 patients, 15.3%), prostate carcinomas (4 patients, 10,2%), and lung carcinomas (3 patients, 7.7%), respectively. Nineteen patients were firstly diagnosed from bone marrow biopsies as metastatic carcinomas. The median overall survival after bone marrow metastasis was 28 days (95% confidence interval: 7.5-48.4). The median overall survival difference was not statistically significant between patients with primary known and unknown tumor (P = 0.973). Statistically significant difference was observed between the survival of breast cancer and gastric cancer (P = 0.028). The most common hematologic symptom was the coexistence of anemia and thrombocytopenia (31%), thrombocytopenia (27.6%) and anemia (20.7%) alone. The median overall survival difference was statistically significant between patients who have anemia and thrombocytopenia (P < 0.005). 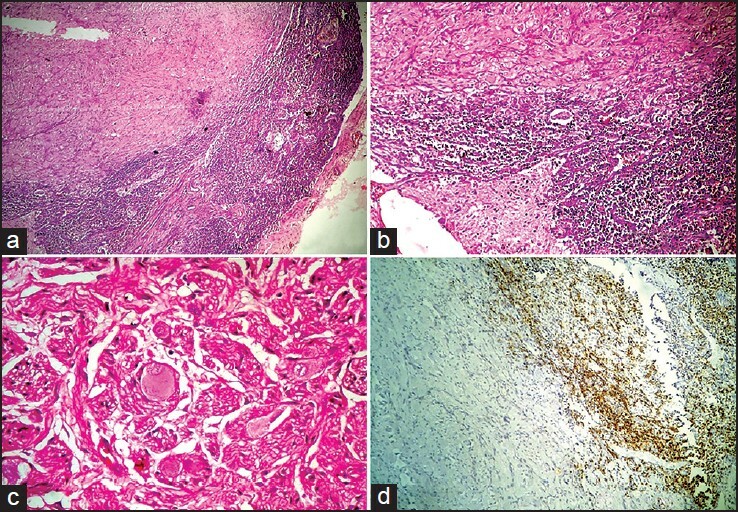 Conclusion: Bone marrow biopsy is an easily accessible, easily applied, a useful procedure for diagnosing metastatic diseases in patients with hematologic symptoms such as anemia and thrombocytopenia besides being an uncomfortable procedure for patients. Furthermore, it is useful in predicting the prognosis and short survey after diagnosing bone marrow metastasis. Context: Japanese encephalitis (JE), an acute mosquito-borne viral disease, is one of the leading causes of viral encephalitis in the South-East Asian region. JE is endemic in Assam. The morbidity and mortality due to JE is significant with outbreaks every year during the monsoons. Aims: The aim was to study the clinicopathological profile of JE; to examine their role in predicting disease outcome; and to document the increase in the incidence of JE among the adult population in this region. Materials and Methods: Clinically suspected acute encephalitis syndrome (AES) cases admitted in Assam Medical College and Hospital during the period of May 2011 to April 2012 were tested by JE virus specific Immunoglobulin M capture ELISA. Statistical Analysis Used: Data analysis was performed using SPSS version 16.0. Results: Out of 424 AES cases, 194 were JE positive. The occurrence of JE in adults was higher (P < 0.001) than the pediatric age group. The study recorded a high rate of renal dysfunction in JE cases. A single case of JE induced abortion and two cases of JE-neurocysticercosis co-infections were documented. Regression analysis revealed that adult population, unconsciousness, paresis and elevated cerebrospinal fluid protein level were associated with a worse prognosis in JE cases. Mortality in JE positive cases was higher than the JE negative cases (P = 0.001). Conclusion: The study attempts to highlight the role played by a combination of clinical and laboratory parameters in assessing the severity and outcome in JE and may help in directing the limited medical resources toward those that need it the most. Context: Antimicrobial resistance showed by different uropathogens is one of the barricades that might hinder a successful treatment. Detection of extended spectrum beta-lactamase (ESBL) production among uropathogens is an important marker of endemicity. Aims: The present prospective study was done to identify the trends of uropathogens, to find the prevalence of ESBL isolates and to study the antibiotic resistance profile of the ESBL and non-ESBL uropathogenic isolates. Materials and Methods: This study was conducted in the Department of Microbiology of a teaching tertiary care hospital from July 2013 to September 2013. All the uropathogenic isolates were identified up to species level by conventional methods. The prevalence of potential ESBL producers was explored. Antibiotic resistance test of the urinary isolates was done by disc-diffusion method and the results were interpreted according to Clinical Laboratory Standards Institute-2013 guidelines. Results: A total of 670 urine samples from male and female patients visiting the outpatient department (OPD) and inpatient department (IPD) of our hospital were collected. A significantly higher number of IPD and OPD males (55.1% and 55.5%) were found to be culture positive. Escherichia coli (55.3%) was the most frequently isolated uropathogen followed by Klebsiella pneumoniae (23%). However, strains of Escherichia coli (41.6%) were the highest ESBL producing isolates followed by Pseudomonas aeruginosa (36.1%). 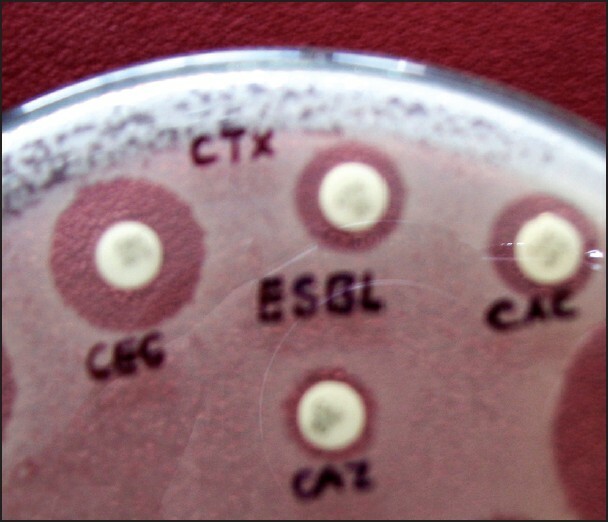 ESBL producing isolates were found to be multidrug-resistant when compared to non-ESBL producers. However, excessive drug-resistance among non-ESBL producing isolates can't be ignored. Conclusion: Our study confirms a global trend toward increased resistance to beta-lactam antibiotics. We emphasize on the formulation of antibiotic policy for a particular geographical area. Objectives: The objective of this study is to compare the incidence and clinical characteristics of severe pneumonia caused by Human metapneumovirus (hMPV) to respiratory syncytial virus (RSV) infection in children. Patients and Methods: A total of 151 children hospitalized with severe pneumonia, were tested for hMPV using reverse-transcription polymerase chain reaction. At the same time, samples were tested for RSV and other common respiratory viruses. Medical records, including clinical, laboratory data, and chest radiography findings, were reviewed for all children. Results: Of the 151 samples, 88 (58.3%) were positive for respiratory viruses. Of the 88 positive, there were 6 (4.0%) with hMPV, 66 (43.7%) with RSV, 13 (8.6%) with influenza A, 2 (1.3%) with parainfluenza virus III, 1 (0.7%) with parainfluenza virus I, 1 (0.7%) with adenovirus and 1 (0.7%) with influenza B. hMPV-infected patients were significantly older than RSV-infected patients (P < 0.001). Children with hMPV pneumonia had fever more frequently (P = 0.03). Two hMPV-positive patients (33.3%) required admission to an intensive care unit, and two patients (33.3%) required mechanical ventilation. The duration of illness was 18.33 ± 7.09 days. These characteristics of hMPV infections were similar to patients with RSV infections. Conclusion: Human metapneumovirus is an infrequent viral pathogen causing severe pneumonia in children. Children with hMPV were older than those with RSV. The disease caused by hMPV was similar in presentation and severity to RSV, with a minority of children requiring additional respiratory support. Background: Reports suggest that the prevalence of community-acquired methicillin-resistant Staphylococcus aureus (CA-MRSA) has increased, and that CA-MRSA is more virulent than healthcare-associated (HA)-MRSA. 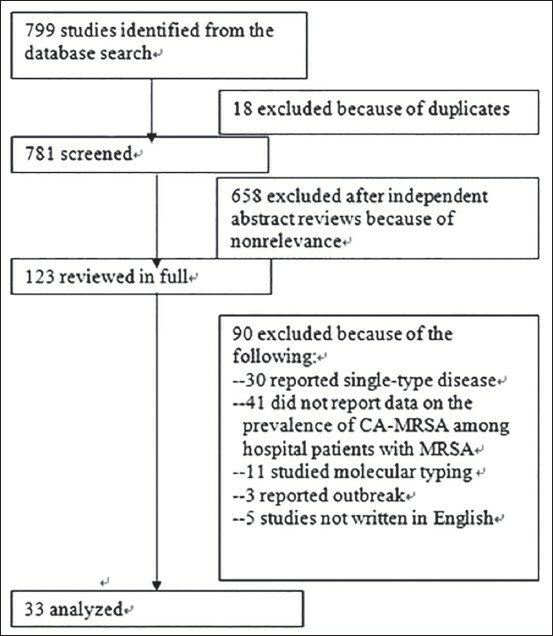 Aims: The aim of this study is to gain a better understanding of the invasiveness and prevalence of CA-MRSA in patients; we systematically reviewed the literature by conducting a meta-analysis. Materials and Methods: We searched the MEDLINE and PUBMED databases from the year these databases were established to January 2013. Results: The pooled CA-MRSA prevalence among 50,737 patients from 33 studies was 39.0% (range, 30.8-47.8%). The pooled CA-MRSA prevalence rates among pediatric and adult patients with MRSA infection were 50.2% (range, 37.5-62.8%) and 42.3% (range, 16.4-73.3%), respectively. The pooled CA-MRSA prevalence rates of MRSA-infected patients in Asia, Europe, and North America were 23.1% (range, 12.0-39.8%), 37.4% (range, 21.1-56.4%), and 47.4% (range, 35.8-59.4%), respectively. Using the random effects model, we determined that the pooled odds ratio of invasive infections in CA- and HA-MRSA was 0.30 (95% confidence interval: 0.08-1.10; P = 0.07, test for heterogeneity P < 0.00001). Conclusions: The prevalence of CA-MRSA in MRSA infection varied with area and population. No difference in the ability to cause invasive infections was found between CA- and HA-MRSA. This finding challenges the view that CA-MRSA is more virulent than HA-MRSA. Aim: This study was performed for the rapid identification of Mycobacterium tuberculosis complex and its resistance to rifampicin and isoniazid, directly from the sputum samples of pulmonary tuberculosis patients. Materials and Methods: A commercially available genotype MTBDR plus assay was used for the identification and detection of mutations in Mycobacterial isolates. A total of 100 sputum samples of pulmonary tuberculosis patients were analyzed by using the genotype MTBDR plus assay. The MTBDR plus assay is designed to detect the mutations in the hotspot region of rpoB gene, katG and regulatory region of inhA gene. Results: The genotype MTBDR plus assay detected 22% multidrug resistant (MDR), 2% rifampicin (RMP) monoresistant and 1% isoniazid (INH) monoresistant isolates. In 22 MDR isolates, the codons most frequently involved in RMP-associated mutations were codon 531 (54.55%), 516 (31.82%) and 526 (13.63%), and 90.90% of MDR isolates showed KatG S315T mutations and 9.1% showed inhA C-15T mutations associated with INH resistance. Conclusion: The new genotype MTBDR plus assay represents a rapid, reliable tool for the detection of MDR-TB, wherein results are obtained in 5 h allowing early and appropriate treatment, which is essential to cut the transmission path and reduce the spread of MDR-TB. The genotype MTBDR plus assay can readily be included in a routine laboratory work for the early diagnosis and control of MDR-TB. Context: Phosphatase and tensin analog (PTEN) gene mutation has been proven for pro-inflammatory property and proliferative potential through tyrosine kinase pathway. We studied mutated PTEN for its pathogenetic association in arterial atherosclerosis. Aims: The objective was to study mutation of PTEN by immunohistochemical method in arterial atherosclerotic lesions and correlate with grades of atherosclerosis, smooth muscle migration in intima, degree of inflammation and Framingham heart study risk factors. Settings and Design: Human, Prospective Clinical study. Materials and Methods: We studied patients with arterial occlusive disease diagnosed by Doppler ultrasonography over a 2-year period. Immunohistochemistry was performed with mouse monoclonal antibodies for PTEN and smooth muscle actin (SMA). Statistical Analysis Used: Chi-square test. Results and Conclusion: Aorta was the single most common vessel affected (21%). Mean age of patients studied was 48.6 years and 80% were male. Mutant PTEN was associated with higher grades of atherosclerotic lesions (P < 0.0001) graded by American Heart Association classification and with smooth muscle proliferation and migration in intima (P < 0.0001). No statistically significant association with the vessel wall inflammation and other risk factors of atherosclerosis. Loss of chromosome Y (LOY) in the bone marrow has long been considered as an age-related phenomenon with an incidence of more than 25% in males beyond the age of 80 years. Though reported as an acquired abnormality in myeloid neoplasms, it has rarely been described in B-lymphoblastic leukemia which primarily is a disease of the young. 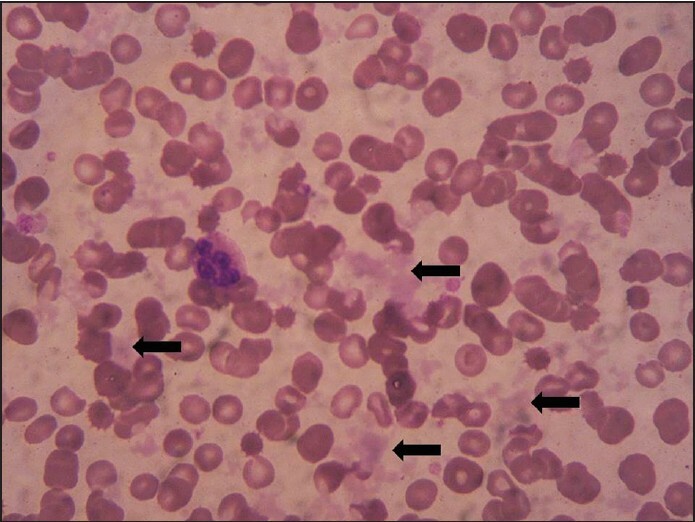 We describe here in three cases of pediatric B-lymphoblastic leukemia with LOY. 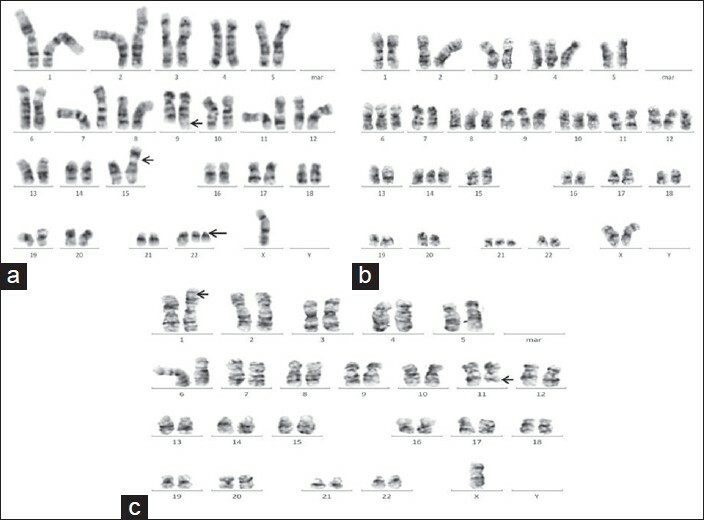 Conventional cytogenetic studies and fluorescence in situ hybridization studies using centromeric probes for chromosome X and Y on peripheral blood samples ruled out constitutional LOY in all the three cases favoring it to be a neoplastic phenomenon. Water quality assessment and timely intervention are essential for health. Microbiology, total dissolved solids (TDS) and free residual chlorine were measured for water quality maintenance in an oncology center in India. Impact of these interventions over a period of 22 months has been demonstrated with four cardinal events. Pseudomonas in hospital water was controlled by adequate chlorination, whereas high TDS in the central sterile supply department water was corrected by the installation of electro-deionization plant. Contaminated bottled water was replaced using quality controlled hospital supply. 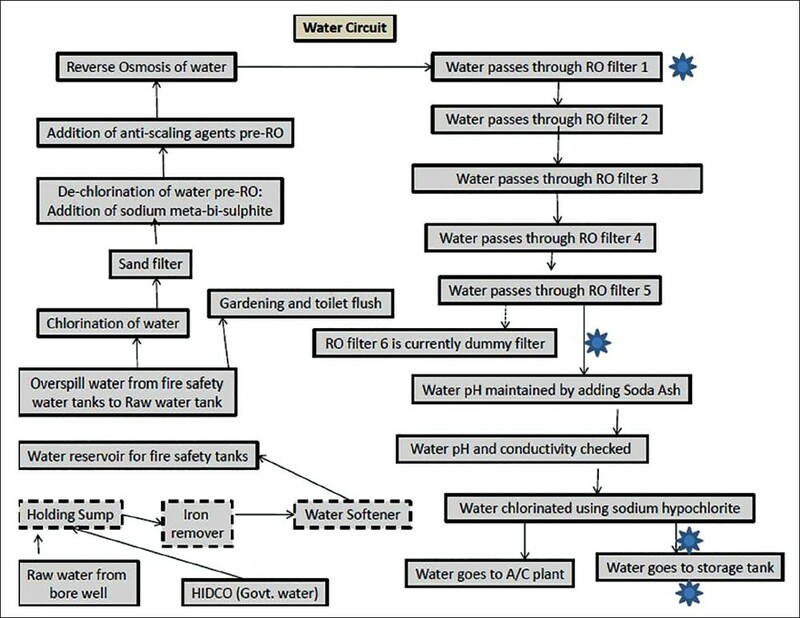 Timely detection and correction of water-related issues, including reverse osmosis plant was possible through multi-faceted approach to water quality. Background: Citrobacter is an important nosocomial pathogen and its multi-drug resistant (MDR) isolates are increasingly being reported across the globe. They are known to produce extended spectrum beta lactamase (ESBL) and harbor CTX-M gene. Objective: The aim was to isolate Citrobacter sp. from clinical specimens, analyze their MDR status and look for the presence of CTX-M gene. Materials and Methods: In this prospective study, Citrobacter isolates positive for ESBL on screening, were confirmed by combined disc method along with minimum inhibitory concentration (MIC) for cefotaxime. In selected cefotaxime resistant isolates, multiplex polymerase chain reaction was done for blaCTX-M gene. Results: Of 146 Citrobacter sp. isolated, most (73%) were from admitted patients and hospital stay of >72 h and prior antibiotic intake were the most common associated factors. Maximum isolates were from pus (41.1%). Citrobacter freundii was the commonest species (49%) followed by Citrobacter koseri (28%); 79 were ESBL producers. Seventy were cefotaxime resistant as shown by MIC. 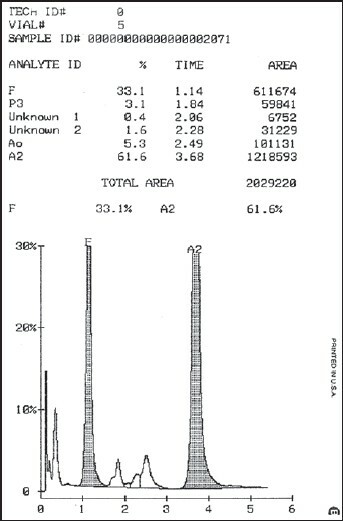 blaCTX-M gene was detected in 15/40 of these isolates, all belonged to CTX-M group 1. Conclusion: Overall incidence of Citrobacter in our setup is low, but they were mostly MDR, and ESBL production was high, which is a cause of concern. blaCTX-M gene detection is important because of its rapid transmission to other bacterial species. Background: Parvovirus B19 infection is associated with clinical symptoms that vary in the spectrum from trivial to severe. The important clinical manifestations are erythema infectiosum or the fifth disease, transient aplastic anemia in patients with hemoglobinopathies, acute polyarthralgia syndrome in adults, hydrops fetalis, spontaneous abortion and stillbirth. Acute infection in nonimmune pregnant women can lead to fetal hydrops. In view of the many complications that can result from acute parvovirus B19 infections during pregnancy, documenting the seroprevalence of anti-parvovirus B19 IgG and its association with the history of abortion in an Iranian population of pregnant women would be of value. Materials and Methods: Serum samples from 86 pregnant women were collected between May and September 2011 in West Azerbaijan province of Iran. Every pregnant woman completed a questionnaire which included age, history of tattooing, blood transfusion, and abortion. Anti-B19 specific IgG was detected by using commercial enzyme-linked immunosorbent assays. Results: Anti-B19-specific IgG antibody was detected in (65/86, 75.6%) of pregnant women. The mean age was 25.56 ± 5.30 years and three women had a documented history of blood transfusion (2 of them tested seropositive for B19). 16/18 (88.8%) of women with a history of abortion were IgG positive. The frequency of abortion sessions in the seropositive group (25 sessions of abortion: 11 women experienced once, 2 twice, 2 thrice and one 4 times) was 4.03 times greater than abortion in seronegative group (2 abortions/21 seronegative women). Conclusion: Our study reaffirms previous reports regarding the higher frequency of abortion among anti-B19 IgG seropositive pregnant women and a possible role of this viral infection in the pathogenesis of abortion. Neuroblastoma, ganglioneuroblastoma and ganglioneuroma atumors arising from the neural crest cells. Ganglioneuroma is considered as the most mature amongst the three and usually has no metastatic potential. 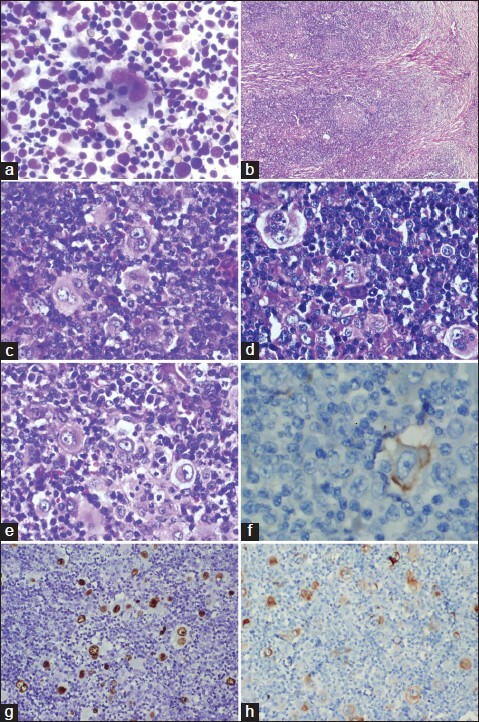 Spontaneous maturation of neuroblastoma into ganglioneuroma is, however, quite well-known. Here, we present a case of an 8-year-old girl child with evidence of metastasis of ganglioneuroma into a lymph node. Primary extrauterine endometrial stromal sarcoma is a rare tumor and it is infrequently associated with endometriosis. 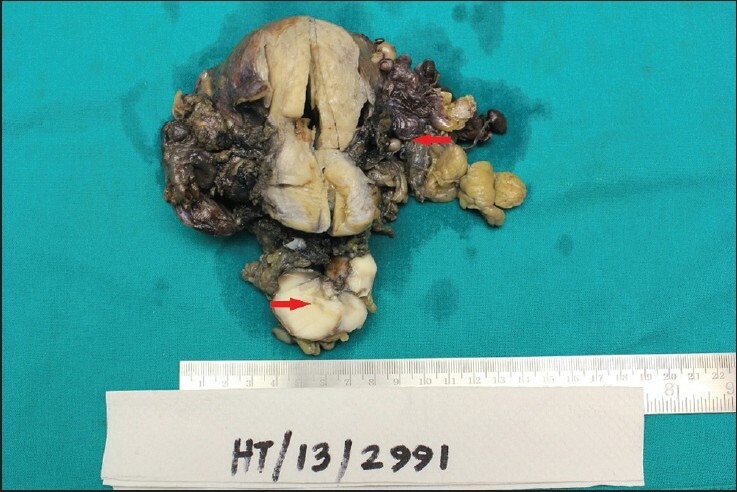 We are reporting a case of this unusual tumor in a 42-year-old female who presented with multiple nodules of tumor in the abdomen and pelvis and with metastases in para-aortic lymph nodes. The right parametrium, in addition, had a focus of endometriosis, which was contiguous with the tumor, confirming its origin. Adenomatoid tumor occurs in the testicular spermatic cord and ejaculatory duct in males and in the fallopian tube and uterus in the females. These are usually small, benign lesions and are mostly incidental findings. 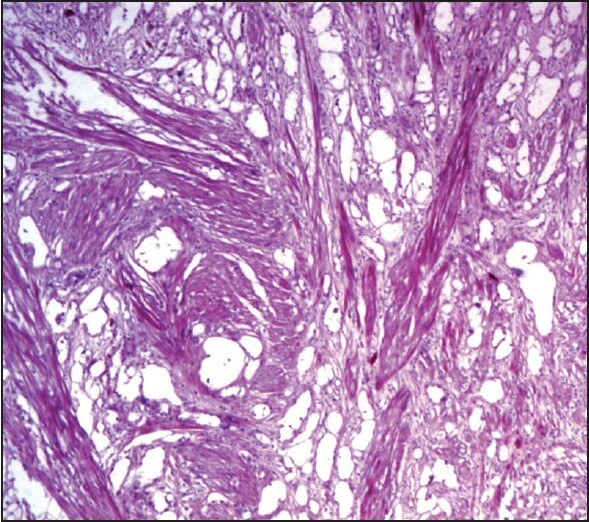 Leiomyo-adenomatoid tumor (LMAT) is a variant of adenomatoid tumor, where in the smooth muscle component is predominant. Only nine cases of LMAT are reported so far in the English literature. We report one case and review the nine cases reported so far. Clear cell myomelanocytic tumors (CCMTs) of the falciform ligament/ligamentum teres are extremely rare. CCMTs are a variant of perivascular epithelioid cell tumors. 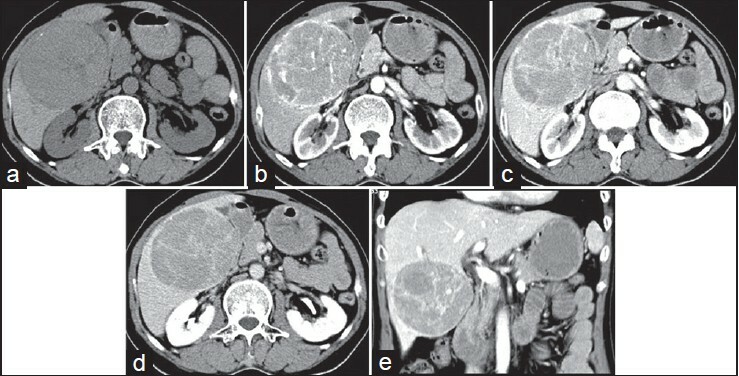 We present a case of hepatic CCMT in a 54-year-old woman with abdominal pain. The patient had an 8.8 cm well-demarcated tumor in the right lobe of the liver. Contrast-enhanced computed tomography showed a heterogeneous mass that enhanced significantly in the arterial and portal venous phases, and was less enhanced in the delayed phase. The patient underwent a right hemihepatectomy and cholecystectomy. The tumor cells had clear to slightly eosinophilic cytoplasm, vesicular nuclei, and were positive for HMB-45 and smooth muscle actin. The patient had no recurrence after 36 months follow-up. A review of the literature identified 10 hepatic CCMTs. Hepatic CCMTs are usually benign tumors of young women that present as large masses located in the right lobe of the liver. 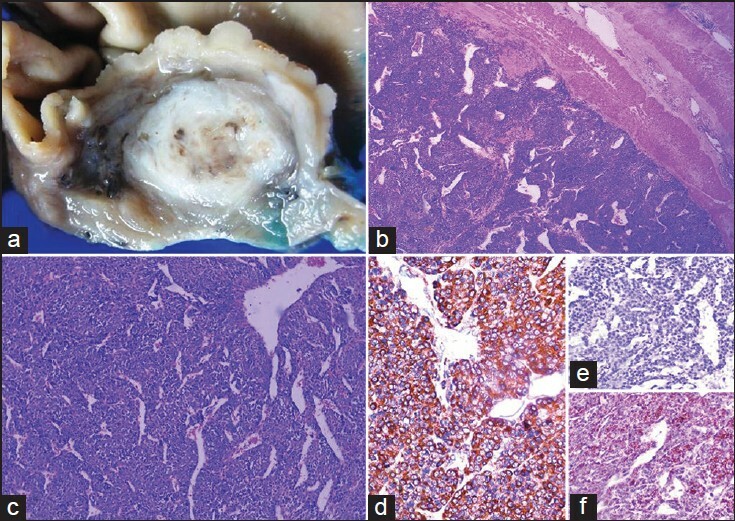 Pleomorphic adenoma is the most common epithelial neoplasm of lacrimal gland. A clear cell myoepithelial carcinoma arising in the background of pleomorphic adenoma is common in the salivary glands but very rare in the lacrimal glands. 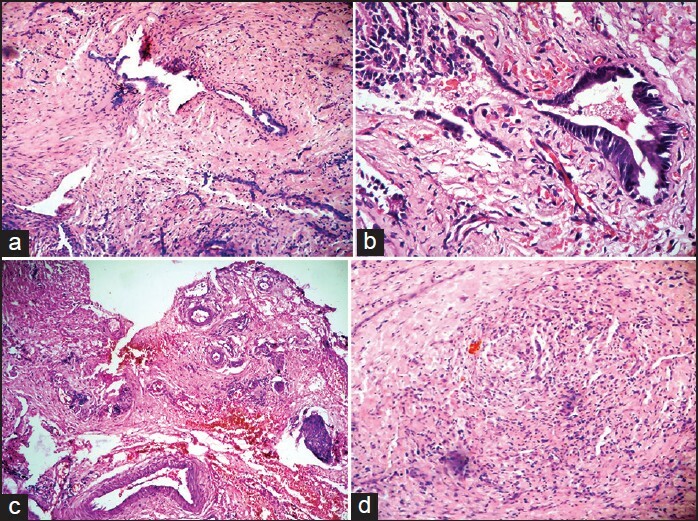 We report the case of a 27 year old man whose lacrimal gland pleomorphic adenoma recurred several times over a period of four years and ultimately evolved into a clear cell myoepithelial carcinoma ex pleomorphic adenoma. A 22-year-old male became unconscious and was found to have left-sided weakness and facial asymmetry. Previously, he had up to 35 excisions for subcutaneous swellings all over the body, commencing at age 6 years. Examination revealed small nodular skin lesions on the neck, the eyelid and hard palate. Two-dimensional echocardiography showed two left atrial masses. 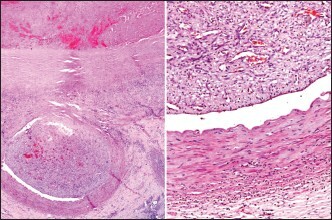 Histopathological examination of the subcutaneous lesions showed cutaneous myxomas with a prominent epithelial component. The left atrial masses were also myxomas. 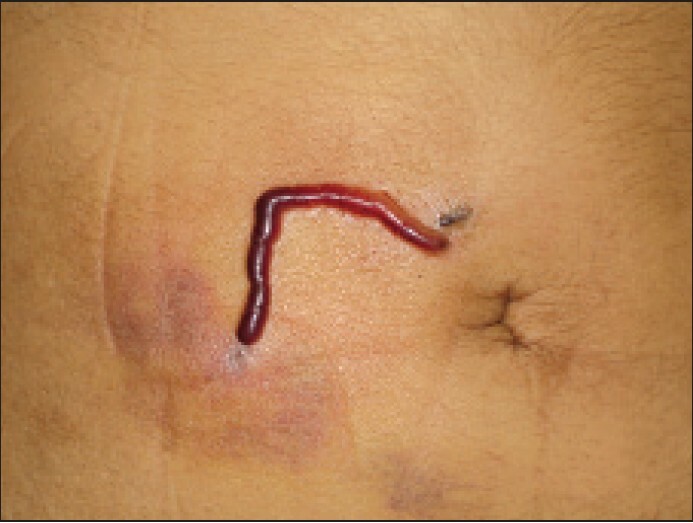 The case attempts to highlight the importance of histopathological examination of subcutaneous swellings. 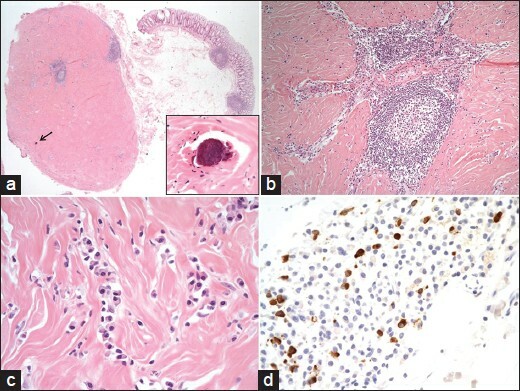 Cutaneous and subcutaneous manifestations, including cutaneous myxomas, are among the earliest presentations in Carney's complex and may herald potentially fatal cardiac myxoma. The prominent epithelial component in cutaneous myxomas may be confusing and cause diagnostic difficulties. 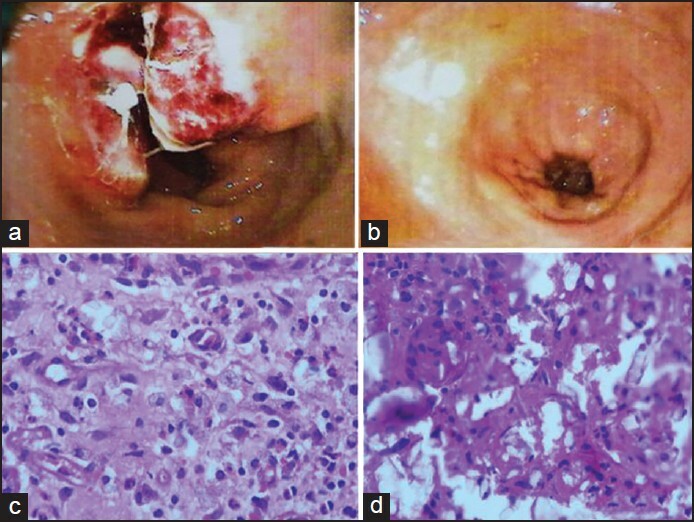 Lymphoepithelioma-like gastric carcinoma (LELGC) is a rare neoplasm of the stomach with an incidence of 1-4% of all gastric cancers. It is characterized by the presence of a lymphoid stroma with cells arranged primarily in micro alveolar, thin trabecular, and primitive tubular patterns or isolated cells. 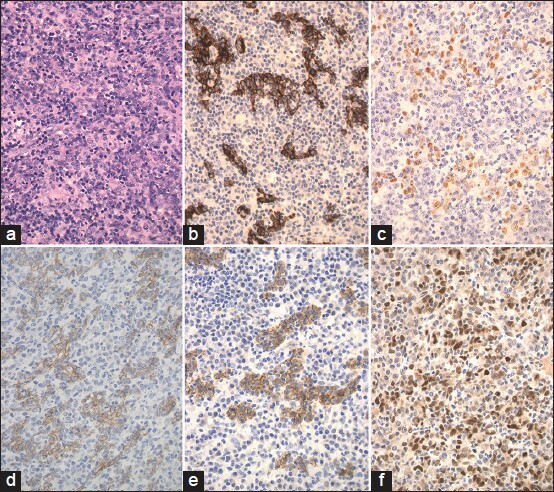 It is one of the histological patterns observed in patients with Epstein - Barr virus (EBV)-associated gastric carcinoma (EBVaGC). In situ hybridization was usually used to confirm the presence of EBV. There are two types of EBVaGC, LELGC, and ordinary type. Approximately, 15-25% of EBVaGC exhibit the LELGC pattern. Here, we described two cases of LELGC and the related literatures were reviewed as well. 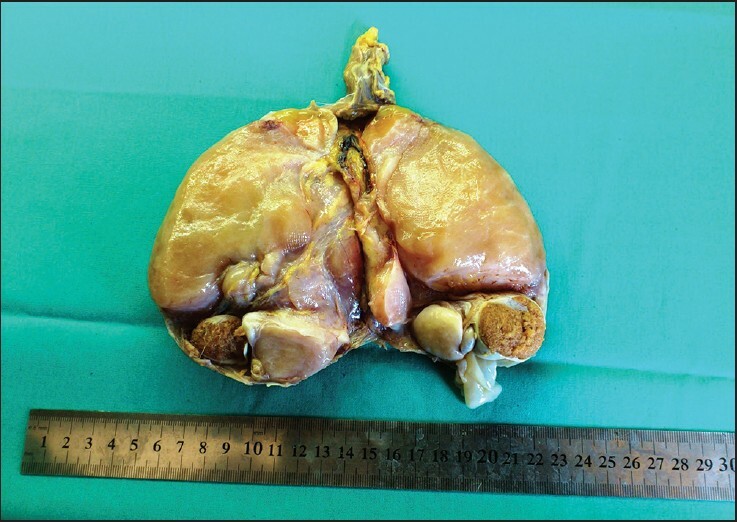 The two cases were submucosal mass from a 59- or 63-year-old man. We found LELGC has special clinicopathologic features and protein expression profile. This should promote us to make a true diagnosis. Myoepithelial carcinoma (MC) is a rare neoplasm of the salivary gland generally occurring in the parotid gland and rarely in the minor salivary glands. 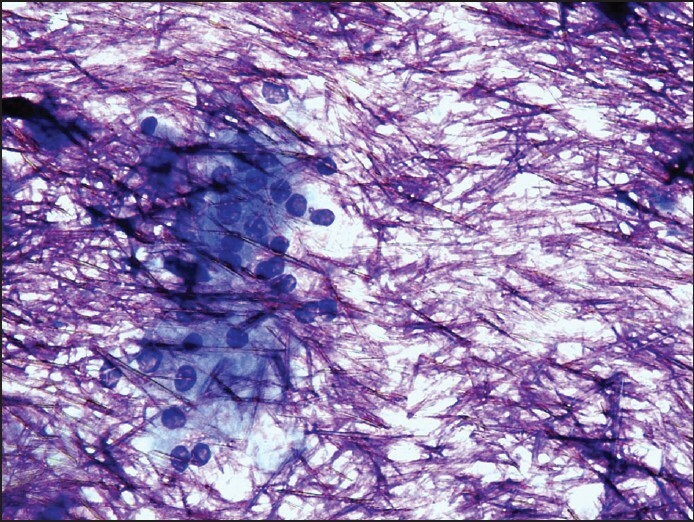 It poses a diagnostic challenge on fine-needle aspiration (FNA) cytology because it can show different cell types and lack clear features of malignancy. This can lead to a range of differential diagnosis on cytology. The diagnostic difficulty can be compounded if the lesion is present at an unusual site. 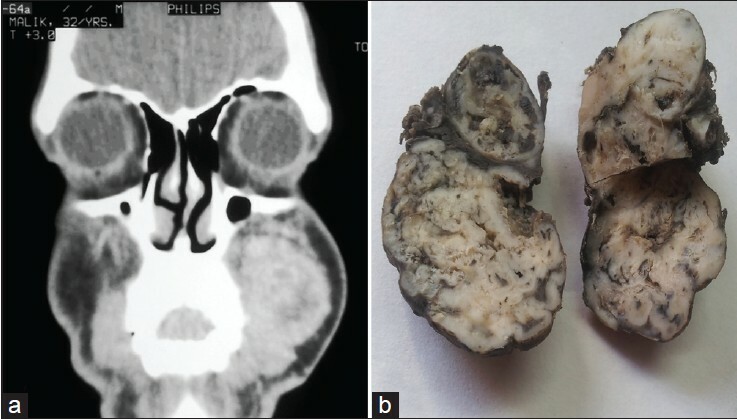 A 41-year-old male presented with a recurrent swelling on the check since 2 years with a prior history of pleomorphic adenoma (PA) at the same site 8 years back. FNA was performed and a diagnosis of recurrent PA or myoepithelial cell neoplasm was given. 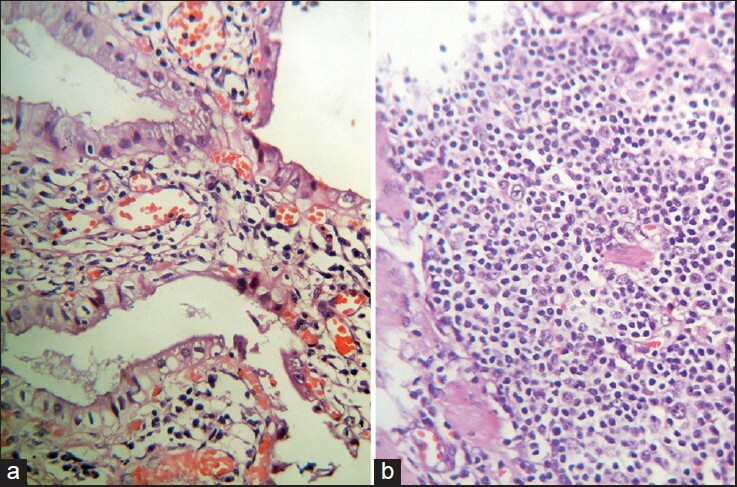 Final diagnosis was made on histology and immunohistochemistry studies and reported as MC of minor salivary gland originating within PA. Pathologist should be aware of the occurrence of MC at the sites of the minor salivary glands in the oral cavity and its wide morphologic spectrum to make a confident diagnosis of MC preoperatively. Wegener's granulomatosis (WG) patients can rarely have antineutrophil cytoplasmic antibodies (ANCAs) directed against myeloperoxidase (MPO), producing a cytoplasmic pattern on indirect immunofluorescence (IIF). This has important implications in the diagnosis and pathophysiology of the disease. We present to you a report of three cases of WG, demonstrating a cytoplasmic-ANCA pattern on indirect IIF, but directed against MPO. It is necessary to diagnose a patient taking into account both the autoimmune test results and the clinical features. Synovium is specialized mesenchymal tissue lining the inner surface of the joint capsule and is the site for a series of pathologic processes that are characteristic, and in some cases specific, to this distinctive tissue. Hemosiderotic synovitis is a rare and inadequately defined synovial proliferative disorder, which develops with recurrent hemorrhages in the joint. The most affected joint from bleeding is the knee whatever the etiology is. Repeated hemarthrosis may produce significant structural alteration of joints leading to chronic osteoarthritis. The most common cause is hereditary clotting factor deficiency diseases like hemophilia. 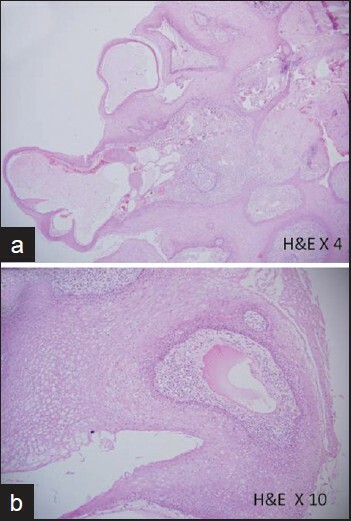 We report a rare case of nonhemophilic hemosiderotic synovitis of the knee joint, in which the patient lacks history of any bleeding diathesis. Its definitive diagnosis was possible only by histopathological examination. The prompt recognition of this distinct subtype of hemosiderotic synovitis and awareness of underlying causes should lead to earlier diagnosis, appropriate therapy, less joint destruction, and better outcomes. Use of automated hematology analyzers for routine blood count reporting has increased the reproducibility and accuracy of test results. However, at times, these instruments may generate spurious test results. Such results can result in inappropriate investigations or treatment decisions in patients. Spuriously normal or high platelet counts carry the risk of under diagnosis of the true thrombocytopenia with adverse clinical implications. We present a patient with smoldering myeloma with spurious platelet count due to cryoglobulins. Sclerosing extramedullary hematopoietic tumors (SEMHTs) are associated with chronic myeloproliferative neoplasms. 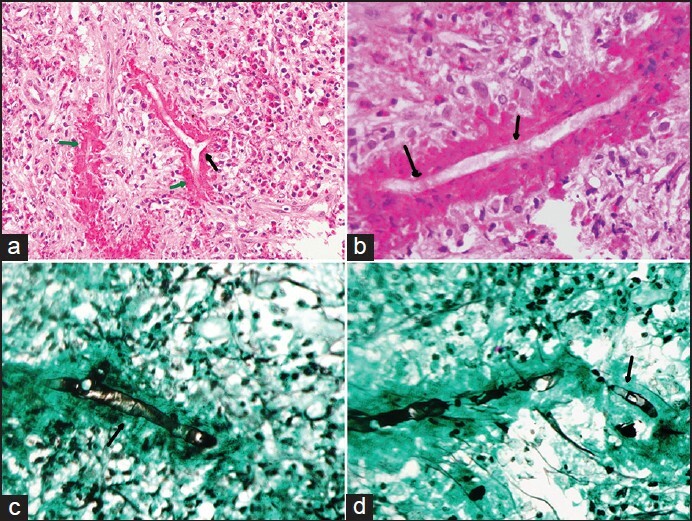 These extremely rare mass lesions were first described in kidney and peritoneum. On histopathology, they are characterized by sclerosis, entrapped fat, atypical megakaryocytes with myeloid and erythroid elements. Only approximately ten cases have been subsequently reported in orbit, lacrimal system, liver, omentum, and skin. 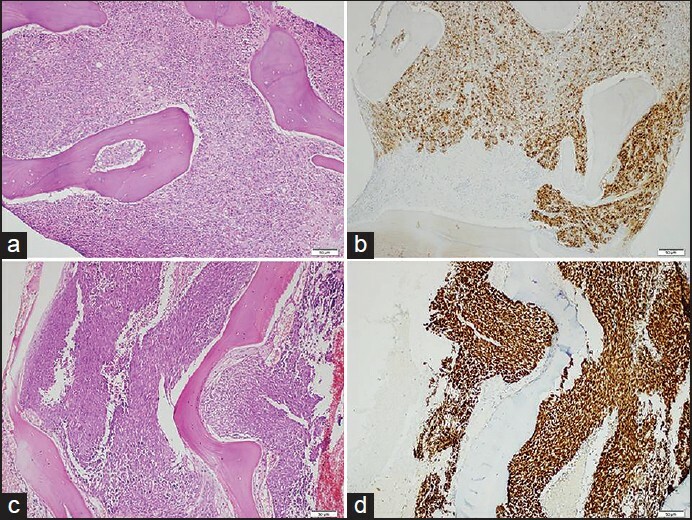 The authors present a case of SEMHTs as incidentally detected omental nodules, while the patient was undergoing splenectomy for Janus kinase-2 negative myelofibrosis. The authors postulate their origin in omentum-associated lymphoid tissue; and highlight the diagnostic dilemma presented by SEMHTs at frozen section. Aggressive natural killer-cell leukaemia is a rare aggressive form of natural killer-cell neoplasm. We report a case of a 40-year-old male who presented with jaundice, raised blood counts,generalised lymphadenopathy and hepatosplenomegaly. The diagnosis was established by flow cytometric analysis of bone marrow aspirate. The patient, however, succumbed to his illness within 2 weeks of starting chemotherapy. To the best of our knowledge, this is the third reported case from India. Infections caused by Brevundimonas vesicularis, a nonfermenting Gram-negative bacterium, are very rare. 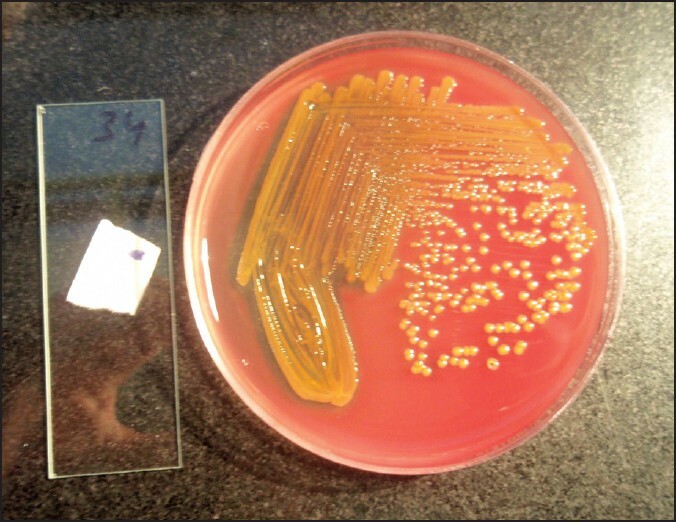 Here, we report the first case of multidrug-resistant hospital acquired urinary tract infection by B. vesicularis. Patient was successfully treated with antimicrobial therapy with piperacillin-tazobactam and amikacin. Indole negative Proteus species are invariably incorrectly identified as Proteus mirabilis, often missing out isolates of Proteus penneri. We report a case of extended spectrum beta lactamase producing and multidrug-resistant P. penneri isolated from pus from pressure sore of a patient of road traffic accident. Correct and rapid isolation and identification of such resistant pathogen are important as they are significant nosocomial threat. Paragonimiasis is an important food-borne parasitic zoonosis caused by trematode species of the genus, Paragonimus occurring in many parts of the world except in Australia and Antarctica. In India, it is an emerging parasitic disease, which is endemic in the northeast states where people have a common practice of eating raw or inadequately cooked freshwater crabs. In these states, Paragonimus heterotremus has been identified as the major causative agent of the human paragonimiasis. The most common clinical form of the disease is pulmonary paragonimiasis; however, extra-pulmonary manifestations are not uncommon. 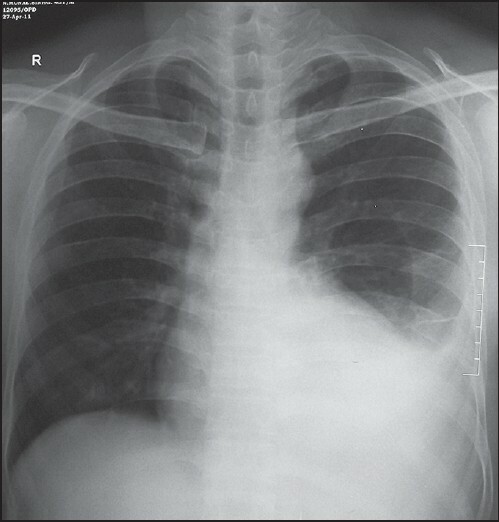 Here, we report a case of primary massive unilateral pleural effusion due to paragonimiasis. The diagnosis was confirmed by finding Paragonimus ova in the pleural fluid. The patient was successfully treated with repeated thoracocentesis and a course of praziquantel.